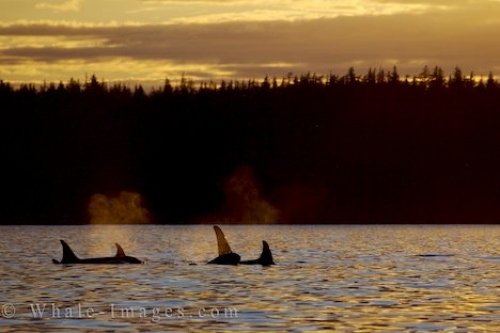 A pod of Orcas surface in the light of the sunset off Northern Vancouver Island in British Columbia, Canada. The waters off Northern Vancouver Island in British Columbia, Canada can be calm and soothing but the hues at sunset make the area exceptionally beautiful as the soft colors fill the sky. The ideal situation is when a pod of Orcas surface and the golden light from the sun twinkles around the Orcas and reflects off their black and white bodies. As the mist from the Orcas blowholes lingers over top of them, the lighting at sunset changes the mist into a yellowish orange shade. The mist looks very mystical and clearly visible as the sunset lighting shines through it. One of the Orcas rolls onto its side and checks out the world around him as the other family members continue in their resting mode in the waters off Northern Vancouver Island in British Columbia. This is a very common sight during the appropriate months when the Orcas spend a great deal of their time in these waters. When the water is calm and the sunset takes over the region, most of the other vessels have gone home for the day and seeing these Orcas makes you realize how precious they are. The blows can be heard for a great distance and if they are chatting between each other, the interference on the hydrophone is minimal. There are no other boat noises in the area and life seems so simple in these waters off Northern Vancouver Island in British Columbia. Sunset pictures are always amazing, but having the Orcas present, adds the extra special touch that you can not find just anywhere. While visiting Northern Vancouver Island in British Columbia, be sure to check out the whale watching tours and experience Orcas in their natural environment.